Superheroes don’t just live in comic books or on the big screen. They exist in real life in the form of emergency medical technicians (EMTs). Where there is an emergency situation, EMTs are among the first responders. These skilled men and women swoop in to help save lives. EMTs have a crucial role in our society, and the amount of gratitude they deserve is more than they could ever earn through paychecks. Are you interested in becoming an EMT? Learn more facts about following an incredible career path as an EMT. According to the USnews.com, paramedics and EMTs are rated #23 in Best Healthcare Support careers. 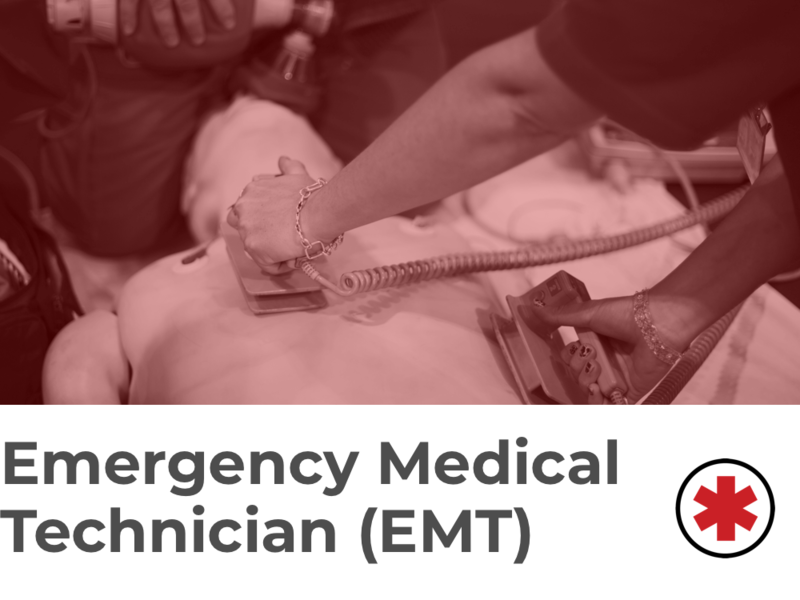 EMT is short for emergency medical technician. They play an important role under a broader title, emergency medical services (EMS). EMTs are entry-level patient care workers, followed by AEMTs, and then the highest level, paramedics. EMTs happen to be the most common provider of emergency medical care in the entire EMS community. These people are highly skilled to aid in life-threatening instances. EMTs are qualified to perform life-saving efforts such as CPR, oxygen administration, take vital signs, spinal immobilization, and basic airway management. As one, you'll respond to most emergencies such as car accidents, heart attacks, violence, childbirth, and more. Usually called in by emergency dispatch, or 911, EMTs show up on the scene, ready to work alongside other emergency responders to take care of what needs to be done. Some schools will require basic math and reading exams before gaining entry, and some programs may require you to be up to date with shots. If you said yes to the four prerequisites, then you’re ready to go and start your EMT training course. The emergency medical technician program can last anywhere between one month to two years to complete, depending on where you go. Vocational schools, trade schools, and community colleges require 120-150 hours worth of coursework. Part of your school coursework should include shadowing a licensed EMT, so you’ll gain firsthand experience in the field. Once you’ve completed your EMT schooling from a state-approved facility and passed a background check, you will have to sit for a licensing exam given by the National Registry of Emergency Medical Technicians (NREMT). Depending on which state you’re in, the exam will be issued by the state or nationally. To be eligible to sit for the exam, you must take it within two years of successfully completing the EMT course. You will be expected to take a cognitive motor exam, and a psychomotor exam, which are your practical skills. The passing standard for the exam is based on your ability to prove you are can provide safe and effective care. If you don’t pass the exam the first time, you can try three more times with a fifteen day wait period between each time. The EMT certification needs to be renewed every two years. Keep in mind: If you choose to attend a school that is not accredited, you may risk the chance of being denied when it comes to taking the licensing exam. Create a list of EMT schools you’re considering. Research their reputations. See what students are saying through reviews. Inspect their training programs. How long are they? What courses and skills are taught? There needs to be a good combination of classroom and field work. Find out if the program has job placement services. Look into tuition pricing and if they offer financial aid of any kind. Learn the graduation and success rates of their alumni. If you are comfortable with the answers for a particular school or schools, then make an appointment to meet with their admissions and go from there! The great news is, to be prepared for a rewarding career, it isn’t going to cost you an arm, a leg, and a kidney. EMT training programs cost, on average, $750-$1,800 for a private program and $200-$1,000 for a public school program. Universities charge $800-$1,000 for their programs, which can last between 1-3 months for EMT. Community colleges will cost you $200-$1,000. Depending on the program, trade schools can cost $750-$1,800. The NREMT licensing exam will cost around $70, no matter which program you choose to get your education through. Aside from the cost of school, expect additional costs for books, required health testing, other vaccinations when necessary, and your CPR certificate if it’s not included as part of the curriculum. These extras can add a couple hundred to your total bill. NAEMT offers scholarships for all levels of EMS certificates and degrees. Additionally, check with your institution of choice to see what its financial aid options are, and if they have payment plans. Find out more about financial aid here. If you’re considering EMT training online, there are a few that are acceptable by the NREMT. However, you may need to make your accommodations for clinical time with either a hospital or an ambulance company. A major part of the job training is through the hands-on experience, which may not be available through online training. Continuing-ed courses, which are needed to keep your license updated, are available online. What Kind Of Classes Will I Take In EMT Training? In your training course to become an EMT, you’ll have between 150-160 hours worth of classwork. While each institution may title class names differently, the sentiment will be similar. Your training hours should include both classroom and field training. The Bureau of Labor Statistics predicts employment growth for EMS, including EMTs, to grow a whopping 15 percent through 2026, which will add close to 37,400 new jobs. The national average for employment growth is between 5 and 7 percent. One of the reasons for this enormous spike in employment growth for EMTs is the fact that the U.S. population is aging. With age comes more related illnesses such as heart attacks and strokes, which will increase calls to 911, thus increasing the calls to EMS. And sadly, there will always be natural disasters, car accidents, fires, and other such unfortunate circumstances calling for the need of EMTs and paramedics. One of the great things about going into EMS jobs is that they are not dead-end jobs. After you’ve gotten your EMT license, you can keep going on through the offered programs. EMT: Start with 1-3 months of training from an accredited school. AEMT: Continue to this level with 30-300 hours of additional training. Paramedic: The top level of capability in EMS is reachable with 6 months-2 years of education, often through an associate degree program. Firefighter: This similar rescue career requires 3-6 months of academy training with several hundred hours of field work involved. Emergency medical careers are often used as a stepping stone to jump into higher level medical careers. It’s not uncommon for EMTs to further their education and become registered nurses or even doctors. If going into the medical field is a dream you’re looking to catch, then a great place to start is as an EMT! According to the Bureau of Labor Statistics website, EMTs and paramedics earn a median annual salary of $33K. The top 10 percent of those in EMT careers received an average of $57K annually. Entry level positions start, on average, at $22K. However, you can earn more by working over the 40 hour work week. Some EMTs double their salary by working as much overtime as they can. You will earn time and a half after you hit the 40 hour mark.